Just out of curiosity, I looked to see when I began this blog -- I knew it was sometime in December. It turns out the third anniversary of this blog has already come and gone (on the 7th.) Thanks for sticking around and, if this is your first time here, please do come back! Tomorrow will be my last new of review for 2014, and then I'll post my top 10 between Christmas and New Year's. Cayetana's Nervous Like Me is a late entry (for me) but a guaranteed entry on the list. 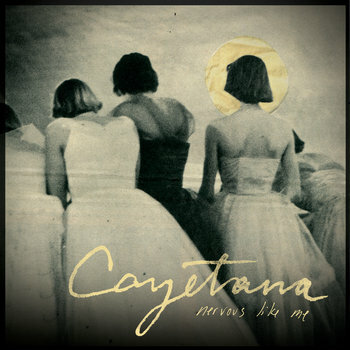 I caught wind of Cayetana on one of NPR's many lists of great music. Even though I scarcely set foot in Philadelphia when I went to college in one of its stifling suburbs, I like to pretend I've adopted it anyway. The fact that Cayetana hails from Philly is definitely a big plus in my book. If you're a public radio person then you've probably heard "Scott, Get the Van, I'm Moving" plenty of times. But that's not even the best song on the album. Cayetana's frenetic energy, wry sense of humor, and full-bore (but hella fun) existential angst are the big draws here. If you had this album on as background music, with the volume turned low, there's a possibility you could dismiss it as hipster noise. But that's pretty slim, because the band's intelligence and sense of purpose grab you from the first chord. Although Mike Ostrov put the album on his top 10 on Ninebullets, to me this is absolutely a young person's album (which is not to say that Mike isn't young at heart. It's just that I'm younger than him.) Case on point, my school just installed a number of fancy touchscreen blackboards. It doesn't particularly improve my teaching life but the speakers are pretty badass, so of course I had to crank Cayetana on them.The coworker I often refer to here was working on some stuff in my classroom at the time. He almost always love the folk or Southern rock I play but was quite nonplussed by Cayetana. So if you're in your twenties (or maybe older?) and wondering if you're always going to feel lost and confused (or nervous), here's some Christmas magic to help you feel a little less alone.